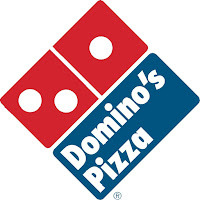 are curious enough about Domino's wing offering to google reviews...and a portion of those seekers end up here reading our thoughts on the popular pizza chain's attempt at serving up buffalo wings. With that in mind, I wanted to revisit my previous review and see if the last couple years of Domino's overall brand revamping did anything to improve the quality of the wings. So, Roosters is a pretty popular casual bar chain in and around Ohio. Practically synonymous with the Columbus area, Roosters is part of the wing-eating fabric of Ohio. I've visited Roosters a few times in the past and this time I decided to put a small taste test together. You see, Roosters wings are "lightly breaded." I know....tragic, right??? Or, maybe not. THE GREAT DEBATE: Which do you prefer? Hot n Ready isn't just for pizza anymore. Little Caesar's now offers wings in eight different varieties. And they're available just as easily as walking in, forking over $5 (Now $6) and walking out. Just like their pizza. I personally like Little Caesar's Pizza. It's not just convenient...it's actually good. And what a value at $5 each. You can't beat that. Good, Fast AND Cheap is an unbelievably rare thing in this world...particularly in food service. The question becomes...can Caesar Wings maintain the triad set forth by the pizza???? Do I really need to describe Denny's in this blog? In a few words...in case you live under a rock...Denny's is a nationally franchised diner. (in a good way) It's a greasy spoon. (but in a good way) It's a heart attack just waiting to happen. (again, in a good way) It's also delicious. It's affordable. It's open 24 hours. What more could you want? Oh yeah...and they have wings on the menu. I can say with certainty that I've never had wings at Denny's before. I got them solely for the sake of writing a review. I can also say with certainty that I will be ordering them again...from time to time. If there was ever a place where the food and menu was secondary to a different, all-together separate attraction…that place has to be Dave & Buster’s. Commonly known as “the adult version of Chuck E. Cheese’s,” Dave & Buster’s boasts a lot of fun under one roof. There’s a lot going on at Dave & Busters, unfortunately, the food aspect of things lacks the flash and excitement of the arcade side. You’re right. There are lots of appetizers masquerading as entrées… and vice versa. The menu is mostly like a Friday’s or an Applebee’s. Trouble is, the prices are too high, the portions are too small, and frankly, it seems like no one in the kitchen at Dave & Buster’s cares all that much. That attitude shows in the lackluster food. Wings included. Is Buffalo Wild Wings the largest national wing franchise? I’m not sure. A quick google search yielded a lot of info on franchises…but nothing that answered my question. It doesn’t matter anyway. 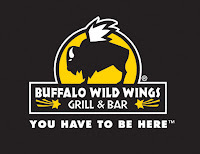 The point is that Buffalo Wild Wings seems to be the largest national wing franchise. They are constantly expanding, building new restaurants, and their publicly traded stock has gone through the roof in the last year. 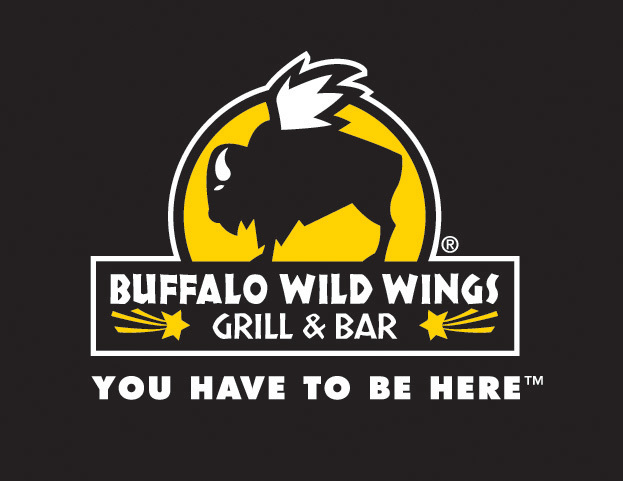 If you spend even just a little bit of time online reading about hot, chicken, or buffalo wings…you eventually arrive at someone raving and recommending Buffalo Wild Wings. You’ll also see stories about people who don’t live near one wishing that they did. And you’ll hear tales of people road-tripping far from home just to try Buffalo Wild Wings. Well, I've finally got around to reviewing the big wing chain that's practically in my backyard. I ran across this confectionery creation about two weeks ago. I didn't think much of it then. I was, apparently, wrong. This recipe is getting a ton of attention across the nets. It seems to be showing up on every news website as they build momentum with Super Bowl/Chicken Wing related stories. It's even been lampooned on Daniel Tosh's Tosh.0 Blog! Click the pic to head over to the "Cupcake Project." You'll get more details and the recipe. 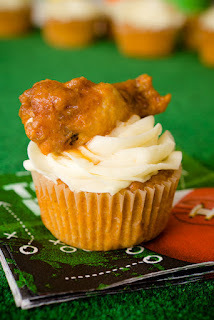 Yes, that's a real chicken wing garnishing the cupcake. No, there's no actual chicken in the cupcake. It seems like the world is getting WING CRAZY as the Super Bowl quickly approaches. Check out these two links. One is a playoff style bracket challenge to determine the Number One Super Bowl Snack. They're already on Round 3 of 4...and Chicken Wings looks like the front runner. Looks like Chicken Wings faced it's stiffest competition in the very first round. I'm sure no one put a lot of thought into how the bracket should be seeded...after all, it's just a silly poll with fancy graphics....but I wonder how Pizza and Wings ended up on the same side of the bracket, let alone going head-to head in the first round. Oh well...go vote for your favorite Super Bowl snack. Among the remaining competitors are "7-layer bean dip," "Chicken Wings," "Sliders," (miniburgers) and "Nachos." Head on over and cast your vote...click the goal posts. 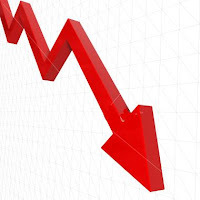 Click the chart to follow the link. 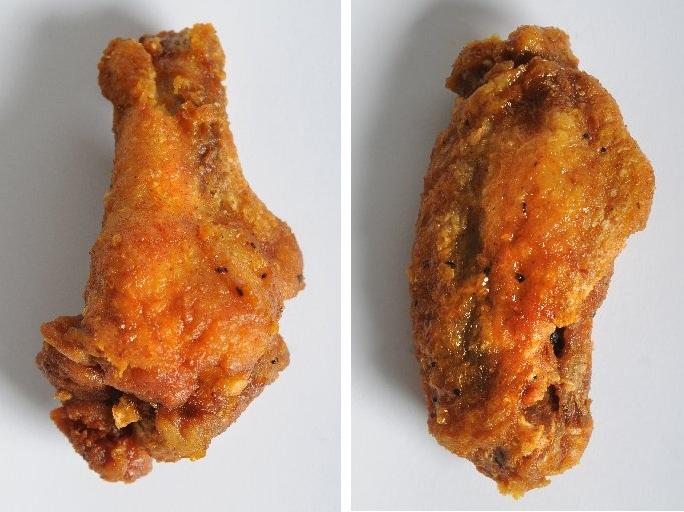 NEWS DESK: The Super Bowl means Super Prices on Chicken Wings. 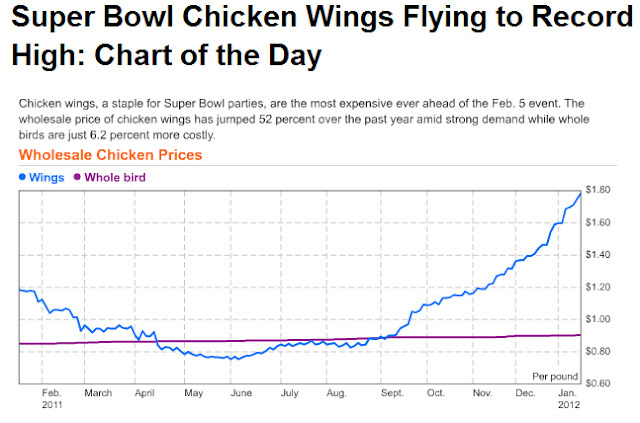 The price of wholesale chicken wings skyrockets every year leading up to the Super Bowl. Check out the chart of the day over at Bloomberg. Click the chart for more details. Applebee’s is a default kind of place. You know what you like, and you know exactly what to expect. You’ve probably got a few favorites on the menu that you get each time, rarely straying off the path. That’s the good thing…and the bad thing…about Applebee’s. And what may be worse…you don’t really expect much from Applebee’s. Well…if you’re thinking about mixing up the same old routine with an appetizer or two…or if you’re just stopping in for some beers and a bite…I think you’ll be surprised by the wings. The Boston Beanery is a pretty famous local restaurant in and around Morgantown, WV. In some ways, the Beanery is synonymous with Morgantown and WVU. People talk about the Beanery and love to grab food and drinks there while they’re in town. The High Street location in this review is the original location that has spawned a pretty successful regional chain of six locations in West Virginia, Pennsylvania and Virginia. The Boston Beanery is modeled in tribute of the pubs of old town Boston. This being the original location and at the mercy of a constant barrage of college kids, signs of wear are showing all around. The place feels small, cramped, and frankly a little dingy. But…also frankly…all that contributes to a certain irresistible charm. I’ve enjoyed each of my visits and I’ve almost always been happy with my meals. The menu is vast and sure to please anyone. But enough about the place…what about the wings, you may ask. Well….you saw the “almost always” a few sentences ago, right? The wings I had on this night were not up to par with the rest of the Beaneries quality menu…and more importantly…they were no where close to what a good wing should be! What went wrong? And if ya don't know...now ya know! According to legend, the classic "Buffalo Wing" is celebrating its 48th birthday today, October 3rd. "On a Friday night in 1964, Dominic Bellissimo was tending bar at the now famous Anchor Bar Restaurant in Buffalo, NY. Late that evening, a group of Dominic's friends arrived at the bar with ravenous appetites. Dominic asked his mother, Teressa, to prepare something for his friends to eat. Teressa had deep fried the wings and flavored them with a secret sauce. The wings were an instant hit and it didn't take long for people to flock to the bar to experience this new taste sensation. 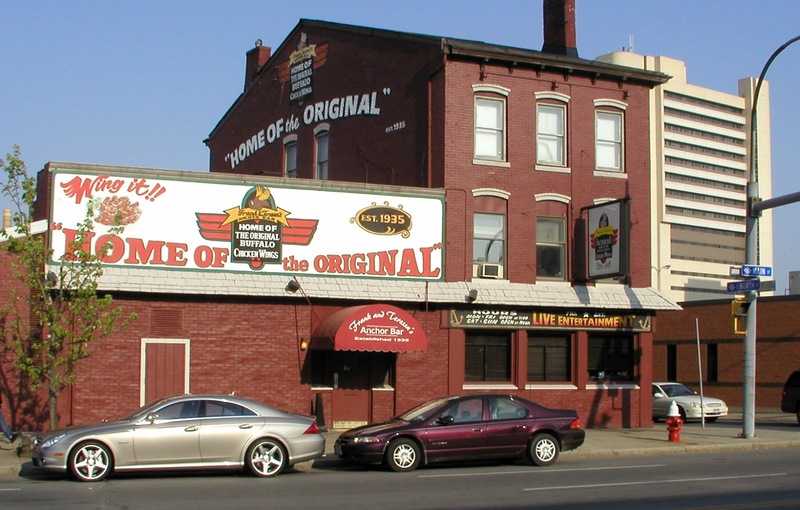 From that evening on, Buffalo Wings became a regular part of the menu at the Anchor Bar." The Cold Spot has three locations throughout West Virginia and on a recent trip I stopped into the Charleston, WV Cold Spot with a few friends. It wasn’t their first time. In fact, I’m pretty sure they made it a point to take me out for some wings during my visit. Thanks guys. Bonus: they got me to there on Tuesday Wing Night. I have to say that The Cold Spot is one of those places that really pushes their wings. Their website boast such phrases as, “It’s a Wing Thing” and “Specializing In Wings & Chicken Tenders” and “Our Wings & Tenders Are Fresh! Never Pre-Cooked & Never Frozen!” So, it’s pretty obvious that they’re very proud of the product. Just makes me all the more excited to try ‘em out! In the arena, behind sections 109 and 322. Open during all sporting events and most special events. Limited menu available. I know. It’s a little backward reviewing the Quaker Steak inside PNC Park before reviewing a brick and mortar QS&L proper. But that’s just the way it’s gonna be. My past experiences with QS&L inside PNC Park have not been exactly stellar. As a rule, the wings are usually barely warm, sometimes chilly, without enough sauce or with too much sauce, and never crispy. If it weren’t for the sake of writing this review…I probably wouldn’t have bothered to get wings on this night. 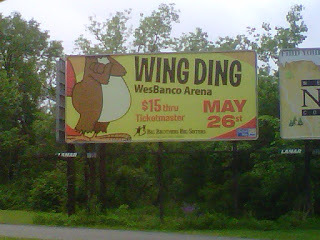 However, if I had opted for some other ballpark fair then I would have missed out on the best PNC/QS&L wings possible. Tonight, they nailed it! It’s hard to write a review when you don’t have a strong opinion of the product. My eyebrows didn’t raise with surprise or delight. Nor did they furrow in disappointment. The wings from The Sports Bar – Undos West don’t seem to illicit a passionate response from me in either direction. Hard to say why. Because the fact is The Sports Bar has a fairly unique product on their hands. There are only so many places to have lunch (or a beer) in Shadyside, Oh. With The Tiger Pub already under my belt and officially reviewed, I decided to have a lunch bite and try the wings at The Central Grille. I was warned before I tried The Tiger Pub wings, however the Central Grille wings came highly recommended. And, as it turns out, rightfully recommended. I was skeptical, of course. After all, one man’s trash is another man’s treasure…just as one man’s hot is another man’s mild. I’ve been lead astray and been disappointed by recommendations before. But this recommendation was a great one. BW3s....The NFL ...And FREE WINGS?! BW3s obviously has a huge interest in the NFL lockout. They need to make money. And for a franchise that bases itself on the slogan, "Wings. Beer. Sports." their profits are directly linked to NFL actually playing games on TV. No agreement, no games. No Games, no TV broadcasts. No broadcasts, fewer customers. 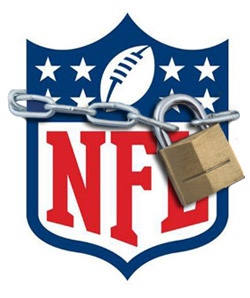 Apparently they have already taken the extraordinary step of writing an open letter to the NFL begging the league to come to an agreement with its players. But now a promise to give six free chicken wings to anyone who signs its open letter. It's essentially an online petition to add some weight to their cause. **note: this is not a real coupon. don't be an idiot! If the lockout ends by July 20, six free chicken wings will be given to anyone who signs the “Save Our Season” petition at the Buffalo Wild Wings Facebook page. Head over there and sign your name. It can't hurt. And maybe we'll all get some free wings. And an NFL season! UPDATE: Obviously this didn't happen. If you came here looking for info or a coupon...keep on looking. The owners and players did reach an agreement, but it was not before July 20th. 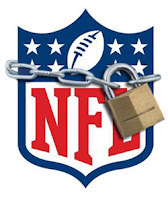 So...good news is...we have an uninterrupted 2011 NFL season. Bad news...no free wings. With a pretty good coupon burning a hole in my pocket I reluctantly decided to add an order of wings to my most recent request from Vocelli Pizza in St. Clairsville. I say “reluctantly” because throughout my years of wing-eating, I’ve been let down again and again by take out, delivery and oven-baked wings. I’ve discussed it before on this blog. Takeout and delivery wings always end up a damp, soggy and lukewarm disappointment. Plus these are oven-baked. Sounds like a recipe for disaster. Well, I can no longer say “always.” Because this time I had a really good order of delivery wings. Another one bites the dust. The Highlands isn't looking so hot. First Wings to Go..now Indigo Joes. 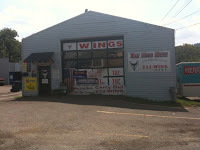 Although I had yet to review their wings...I'd been there a few times and had fine meals with good service. I guess it all comes back to "Location. Location. Location." 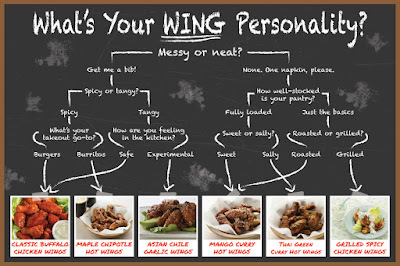 Has anyone tried their wings? What did you think of them and Indigo Joe's in general? Garfield’s is the kinda place that’s not on the top of anybody’s list. Good lists. Bad lists. They just don’t seem to be on anyone’s radar. Grabbing a meal at Garfield’s is usually more influenced by convenience than true craving. Located inside the Ohio Valley Mall, Garfield’s anchors the wannabe-food court at the main entrance, along with Osaka Japanese Steakhouse and Fabio’s Pizza. They’re not known for wings. …or steaks …or burgers …er, wait a minute…they’re not really “known” for anything in particular. Are they? But to be honest (and why wouldn’t I be?) I really enjoy the food every time I eat there. Come to think of it, they used to have a kinda Mexican influence. American food punctuated with enchiladas and quesadillas was the “thing”. Yeah, that’s it. Well, that “thing” is gone as of my most recent visit. Seems like an Applebees clone. There is nothing particularly standout-ish about Garfield’s now…except a very surprising and pretty good order of wings. 2011 Wing Ding Wrap Up and Reviews! The 8th Annual Wing Ding is in the books. Twelve different restaurants and vendors from the Ohio Valley donated their time, hard work and wings. There was lots of variety...so everyone was sure to find a favorite. Fried or grilled? Hot or mild? Greek Feta or Strawberry BBQ? Like I said...there was something for everyone. It's a long post. Enjoy! The time has come to review the wings at TJ’s Sports Garden. Sports and wings go hand in hand, so they gotta be good. 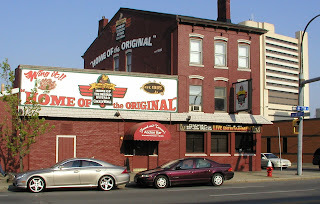 TJ’s is arguably the most famous restaurant in the Wheeling, WV area. Few others come close. They’ve built a reputation on great food, good prices and providing a fun and safe place for every major demographic. If it’s family friendly dining, getting your party started with friends on a weekend or gathering to cheer your favorite teams on the (what seems like a thousand) big screens…TJ’s can more than accommodate. Background info and accolades aside…I’m here to review the wings. The wings are tucked inconspicuously into the appetizers menu. I’m not sure the wings are huge draw here for most people. But that doesn’t mean they shouldn’t be. Tonight’s order was quite good. Wings are costing restaurants less dinero. So...no more excuses for rising wing prices being passed along to consumers! Right?! Maybe Buffalo Wild Wings is a good investment. The WING DING is coming up this Thursday. Get your tickets in advance: CLICK HERE! We'll be there casting our vote for the Best Wings in the Ohio Valley. And of course, we'll report back here with our results and the official results! As you see, they make no other claims. What about the crispiness? Are they breaded? Oven baked? Deep fried? Let’s find out, shall we? Let me just admit it right from the start. I’ve probably had 19th Hole’s wings more than any other wings around Wheeling. And there’s a reason for that….I love ‘em. I like the wings, the beer, the bartenders, the dirty checkerboard floor, the golf scorecard-style fairway boundaries painted on the drop panel ceiling, and meeting my buddies for drinks and conversation. I like everything about this place. It’s a hole in the wall but not quite a dive. At least, it’s not a dive in this town. I’m sure some big-city sophisticates out there would wonder just what they’ve gotten themselves in to. It ain’t pretty. But that’s just how I like it. There’s a mild golf theme to the decorations around the place, but for the most part the stuff hanging on the wall is standard sports bar swag. Pens, Steelers, Pirates, WVU and tons of flat screen tvs…it’s all here. As I said, I’ve wolfed down these wings quite a bit over the years. But now it’s time for an official review. Generations has been a staple of Wheeling, WV for a loooong time. At least it seems that way. I’ve had their wings before. But it’s been a while…and I have to admit, I don’t ever remember them being as good as they were tonight. Wednesday nights at Generations is Wing and Perogie night. You read it right. Wings. And Perogies. As if the Wing Night special wasn’t enough…I have to admit, the perogie addition was quite an attractive bonus. Both wings and perogies are 40 cents each. Sounds good! 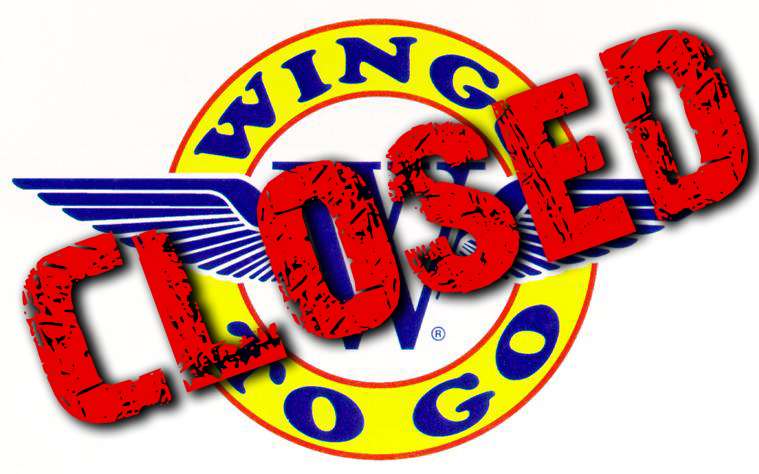 From the news desk...Wings To Go Highlands location near Wheeling has closed its doors for good. "Unfortunately we must report this location is now closed. Thank you to all the faithful Wings To Go Lovers that supported us over the past year and a half!" Sad news to be sure. The first time I tried Wings To Go was shortly after they first opened. In anticipation, I had researched their menu online at other Wings To Go locations. I was more than excited to try the new wings in town. They are a national chain, after all. They must be doing something right! Right? We were out n about on a Monday evening and neither one of us felt like cooking or cleaning the kitchen after cooking…so like every other American with a dime in their pocket, we opted for convenience and went out to eat. As so often occurs, I was in the mood for wings. I had tried the wings at West Texas Roadhouse before I started this blog, so I knew they were good enough to satisfy my craving. And recently I had West Texas Roadhouse wings on a take out order…but it was time to review the wings properly. We were traveling on family matters to Roanoke Rapids, North Carolina and it so happened that right next door to our Hampton Inn was a welcoming site. ..a wing joint, “Buffalo Wings and Rings.” Located in a strip mall/shopping plaza, this place is has all the indications of a national sports-themed chain. Though, among the decorations are local sports teams to give it that hometown feel. Who cares really? The place was cool, clean and laid back with a long bar or table service…so that’s enough for me. Needless to say…I had to stop in and try the wings…and the rings. I stopped into the Tiger Pub for lunch one afternoon. 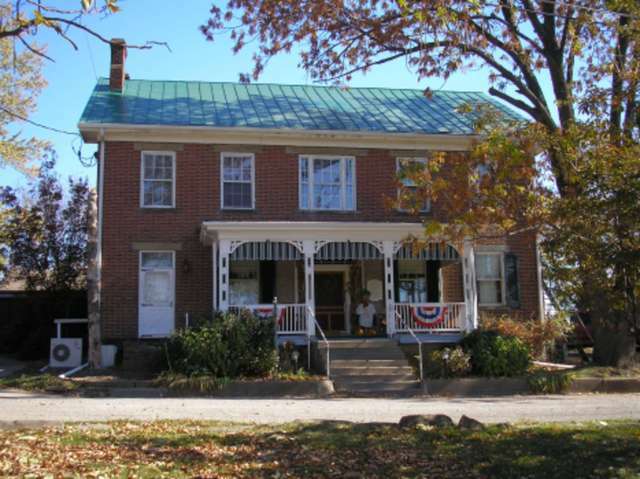 For those would don’t know, the Tiger Pub is a small mom and pop operation that serves up some serious lunch fare with daily specials with a home cooked and diner feel. The Tiger Pub has been around for a long time. I’m here to tell you about the wings…and there’s not much to tell. 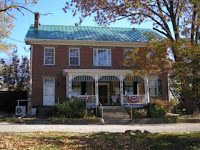 Drover’s Inn. Ah, Drover’s. Quite a reputation around the area to say the least. Their slogan sums that up. “If you haven’t tried our wings then you don’t know what you’ve been missing.” So, how do they rate under review?